In 2012, when St. Joseph’s University opened a multi-million-dollar addition to its library, a highlight was the new reading room: a comfortable, inviting space with two-story-high ceilings and large windows along one wall. Sounds like an ideal, even inspirational space for studying, doesn’t it? How surprised would you be to learn that, right now, Villanova University has a similar reading room? Falvey Hall’s reading room features a two-story-high arched ceiling and enormous windows along not one but two walls that flood the room with natural light. I joined Falvey Memorial Library’s staff in 2002; at that time the room was a staff-only space used to store the VHS tape and DVD collections as well as microfilm and microfiche. It also housed the Mathematics Learning Resource Center. Whenever I brought a new student-employee through there, each one would have the same reaction: we’ve got to make this place a reading room again. 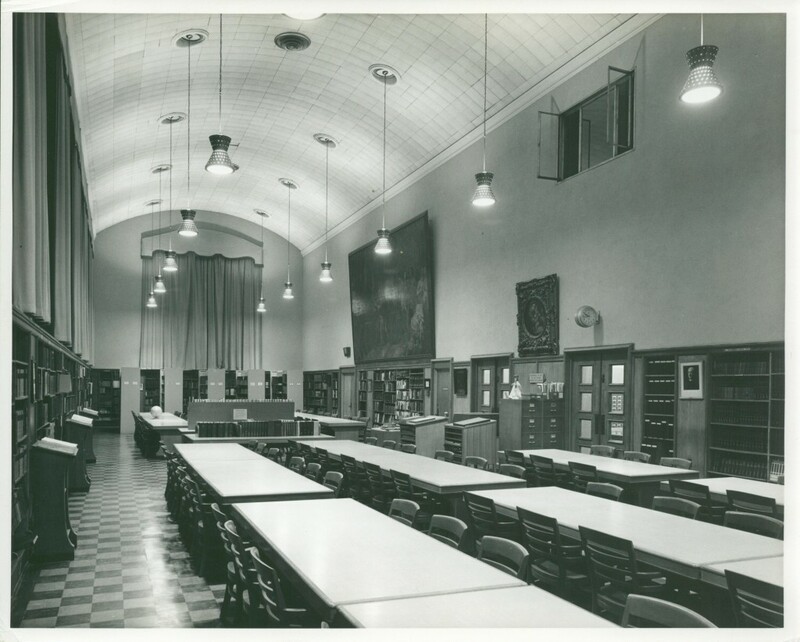 In 1949, when our current Falvey Hall opened as the Villanova College Library, The Villanovan described the reading room as follows: “The reading room, the largest room in the structure, occupies the entire two floors of the north wing. Book racks line the walls at about shoulder level, and long blond-oak tables with matching chairs are arranged in the room.” “Curtained windows, almost from the floor to the ceiling filled this room with homey warmth” (“A Century of Progress” The Villanovan, Feb. 15, 1949, p. 3). How did such a wonderful resource for students become unused and forgotten? Less than two decades after its opening in 1949, the Villanova College Library had become inadequate to meet the needs of a growing University and its expanding student body. Villanova built a new library, Falvey Memorial Library, which opened in 1968. This new facility included a reserve room. Filled with tables and chairs, and intended for quiet study, this one-story room on the new library’s ground level served as a replacement for the former library’s reading room. Also at this time, the University had been providing a graduate program in library science, and, the Library Science Department had occupied the Villanova College Library’s second floor. After the new library opened, the Library Science Department moved into the Villanova College Library’s first floor, including the reading room. “On September 21, 1974, the dedication of the Eastern Area Branch Library Examination Center took place. This collection was located in the … reading room for several years. After the Examination Center moved, the room was used for the professional collection of the Library Science Department, including children’s literature, reference resources and other materials. [In the] late 1980s, microfilm, microfiche, film, slides, VHS tapes and DVD collections were housed in that area. Early in the 1990s when the Library Science program was terminated, [additional reading-room] space was allocated to the Mathematics Learning Resource Center,” according to Father Gallagher. In 2004, renovations to Falvey Memorial Library’s first and ground floors eliminated the reserve room: a study space in the library in which quiet was actively enforced. By this point, restoring the former reading room in Falvey Hall seemed to be a dim prospect until 2010, when the new Villanova Law Library opened, vacating Garey Hall, its previous site. Falvey moved its print collection of bound periodicals—100,000 volumes—to remote storage in Garey Hall. The freed-up space in Falvey allowed other shifts in library collections and offices, like a picture-slide puzzle, which eventually allowed for the Library to transform its second floor, in 2011, into the Learning Commons. As part of this transformation, the microfilm, microfiche, 16mm film, slides, VHS tapes and DVD collections that had occupied Falvey Hall’s reading room since the late 1980s—even the Mathematics Learning Resource Center—were relocated, thus emptying the reading room and making it available to be restored to its original purpose. Even more unexpected than the reading room’s restoration, however, is the restoration of a 12 by 19 feet painting, which has hung on a reading room wall for over 50 years. Pietro da Cortona’s “Triumph of David,” University staff have discovered, is more rare and valuable than previously thought. 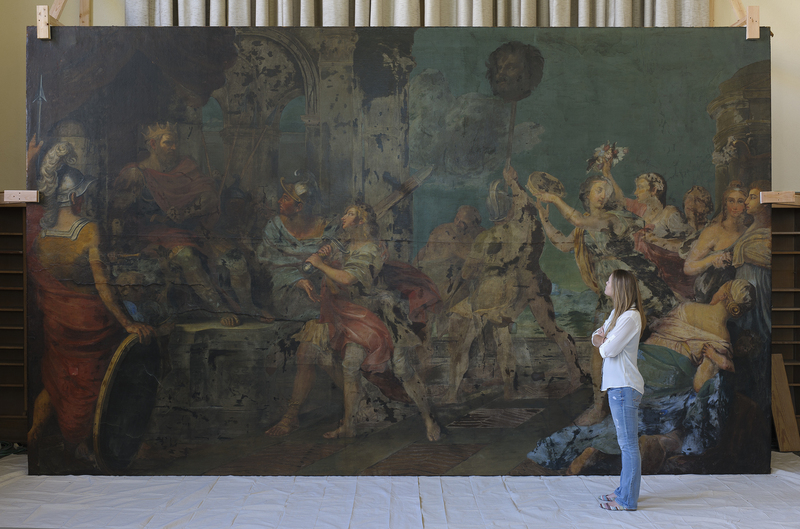 The painting’s unusual size requires that it be restored in the reading room, but that’s another story. Come to the reading room and become inspired by this majestic study space, by its connection to Villanova history, by its rare painting, and by the story of David and Goliath. 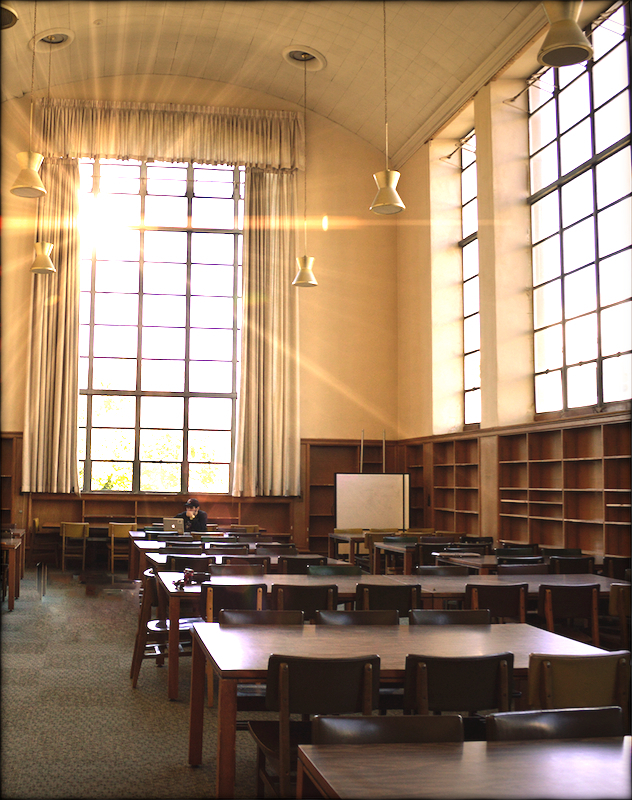 The reading room will open for 24/7 quiet study beginning at 5:00 p.m. on Thursday, Oct. 24. Gerald Dierkes is an information services specialist for the Information and Research Assistance team, senior copyeditor for the Communication and Service Promotion team, and a liaison to the Department of Theater. Top photo by Alice Bampton. Middle photo courtesy of University Archives. Bottom photo courtesy of University Communications.